Hanan Challouki and Taha Riani are the managing partners of the creative agency Allyens, based in Antwerp, Belgium. With their agency, they focus on inclusive and viral communications, with millennials as their primary target audience. Instead of putting the emphasis on the differences between people in our super diverse societies, they focus on the similarities, building inclusive strategies and developing campaigns for a wide array of clients. 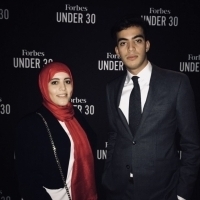 They were recently listed as one of Forbes’ 30 under 30, for their innovative approach to marketing and communications.